After finally getting around to it, I made a stop to the Hollywood Fish Market and Deli to see what it was like. With "Fish Market" in the name, I thought the place would be more like Captain D's rather than say, a fish market. However, the second you walk in the place, you KNOW it's the latter. The place reeks of catfish and whiting, which can bought raw by the pound. With the aroma being that strong, I knew that I wasn't eating there for the smell was overwhelming. After looking over the menu, which includes a decent selection of "Soul" food that's already prepared, I decided to get the Catfish Fillet sandwich with a side of spaghetti. 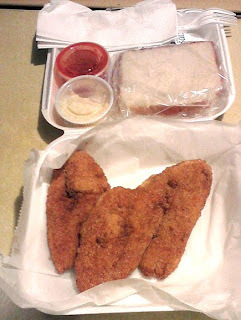 The "sandwich" is actually three pieces of catfish fillet, two slices of bread, cole slaw and a small cup of hot sauce. The catfish fillets are cooked to order, can be both good and bad. It's good because the fillets are coming fresh out of the pan (or whatever it is cooked in), and bad because of the aroma that the fillets give off. 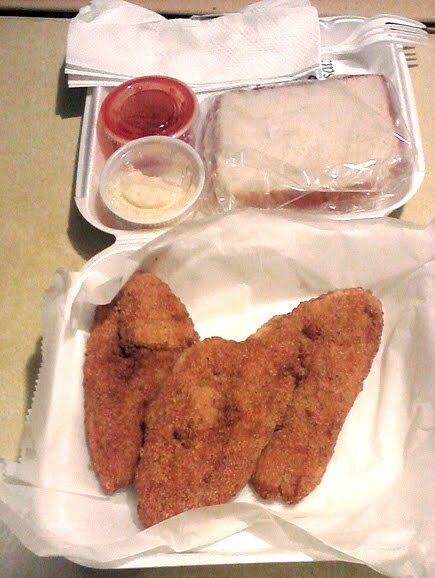 I know this sounds like a "duh" moment, but in all the times that I've gotten catfish for take out from places like the Soul Fish Cafe and Millington's Miss Sipps, I have never had catfish that was that strong in odor. In fact, I had to drive home with the windows down on a rainy day in order to vent out the smell. In putting up with the stench, I hoped the "sandwich" would be worth it, and that wasn't necessarily the case. After getting home and turning on all the oven vents in my kitchen, I finally got around to eating the catfish. The fillets, which were fried and breaded (and in my opinion, a little overcooked), were extremely salty, to the point that the hot sauce wasn't even necessary. In order to cut down on some of the saltiness, I poured some Heinz Gourmet Salad Vinegar on them, which made the fillets more palatable. Also, when I put one of the fillets between the two bread slices and ate it as a sandwich, the catfish didn't seem that bad. The spaghetti that I got as a side was basic pasta in meat sauce, and it was a decent complement to the catfish. After looking at the yellow coleslaw, I decided to pass on it (in a bit of disclosure, I'm not a big coleslaw fan). In assessing my meal, I would rate it a "5" on a ten-point scale. Overall, my experience at the Hollywood Fish Market and Deli was not a positive one. While the staff is very friendly and helpful, the overpowering smell of the deli and the aroma and saltiness of the catfish fillets was a little too much for me. Although this place may be okay for some people, I can't see myself returning there for another meal. The next time that I have a craving for catfish, I'm heading somewhere else for it.